Category for hacks pertaining to the Final Fantasy VI game on the SNES. Next, the randomizer will ask for a seed value. If you don't know which seed you want, just leave this blank and the randomizer will choose one for you. The seed value is an integer number that can be used to share the same randomization with other people. It's like a signature for the game that Beyond Chaos creates. If you want to play the game along with a friend, you can use the same seed. o Shuffle characters' in-battle commands. w Generate new commands for characters, replacing old commands. z Always have "Sprint Shoes" effect. Vanish/Doom, and the Evade/Mblock bug. c Randomize palettes and names of various things. i Randomize the stats of equippable items. q Randomize what equipment each character can wear and character stats. e Randomize esper spells and levelup bonuses. t Randomize treasure, including chests, colosseum, shops, and enemy drops. n Randomize window background colors. s Swap character graphics around. p Randomize the palettes of spells and weapon animations. The randomizer generates two files, a patched rom file, and a mini-FAQ. Both files will have the seed value in their name. To play the game, load the patched rom file in your emulator. The mini-FAQ is a text file that mainly includes information about where to get items; colosseum rewards, monster steals and drops, shop info, and monster rages are all included. Beyond Chaos is a randomizer, a program that remixes game content randomly, for FF6. Every time you run Beyond Chaos, it will generate a completely unique, brand-new mod of FF6 for you to challenge and explore. There are over 10 billion different possible randomizations! Nearly everything is randomized, including treasure, enemies, colors, graphics, character abilities, and more. Beyond Chaos is also customizable. Using the flags in the above section, you can choose to only randomize certain parts of the game. Every flag you select will make the game a little more random, and also a little more difficult. Therefore, even experienced players should be able to find some challenge in the resulting game. 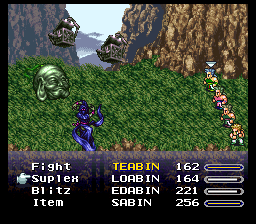 As the game progresses, enemies may become more and more difficult, so that it becomes necessary to develop specialized strategies for individual formations. Because of the extent and the severity of the modifications made by Beyond Chaos, it is not recommended for competitive play. It is mainly intended for casual play, though if you would like to play it competitively anyway, go for it. Also note that there is another FF6 randomizer intended for races, made by Dessyreqt and Lenophis, that makes more conservative changes. That one is simply called "FF6 Randomizer", or "FF6 Rando Classic Original Flavor". 1. To remix game content so thoroughly that even veteran FF6 fans can feel as though they are playing the game for the first time all over again. 2. To create a challenging and festive result that encourages memorable scenarios, without making the game impossible for a casual player to complete. 3. To create a tool that is useful to the FF6 rom hacking community by being both open source and accessible, and by showing off a wide variety of potential mods. Q: How do I play Beyond Chaos Ancient Cave mode? A: There are two codes you can use. "ancientcave" is for the standard Ancient Cave mode with ~200 maps and takes a very long time to complete. "speedcave" is a shorter, faster mode (~100 maps) that is designed to be completed in one sitting. Input the code in the flags. For vanilla Ancient Cave mode, I recommend using "ancientcavez". Q: How do I play Beyond Chaos Bingo? A: The code is "bingoboingo". Use the code in the flags and the randomizer will ask you some more questions when the randomization is complete. Q: I lost my seed number but I still have the rom. Can I find my seed number again? A: The seed is displayed in the auto-generated guide, in the rom's SNES header, and in the opening sequence with the magitek armor. Q: I'm at Vargas but I don't have Blitz. How do I beat him? A: You can defeat him normally without Blitz. His HP was lowered to make him beatable without much (if any) grinding. Q: How do I defeat TunnelArmr without Runic? Q: How do I defeat Ultros at the Esper's hideout without Sketch? Q: Speaking of Sketch, was the Sketch Glitch patched? A: No. Believe it or not, there are people out there who want to play using the Sketch Glitch, which is why the randomizer is based off of the FF3 US 1.0 rom. In an ideal world you would be able to choose whether or not to patch the glitch, but since there is such small demand for that kind of feature and it would take considerable effort, I haven't implemented it. Q: The Moogle Charm doesn't work. A: It was nerfed. FF6 uses a threat level based random encounter system, and Moogle Charm increases threat level by the lowest possible value without removing encounters altogether. The specifics are a bit complex, but you should think of it as having about a 1/256 encounter rate if you've been wearing it for a while. Also, some later dungeons might randomly ignore Moogle Charm altogether. Q: I'm in a dungeon and the encounter rate is insanely high. A: Some later dungeons have a chance to become high encounter rate dungeons. However, these dungeons are twice as vulnerable to the effects of Charm Bangle and Moogle Charm. Q: The switches in the final dungeon don't seem to be working. A: They work, I assure you... it seems like the game is just a bit buggy when a group it doesn't expect stands on the switch. Usually you can get it to work by cycling through every party while standing on the switch. In the worse case scenario (you rarely need to do this) have all other parties leave the room, then stand on the switch. It also seems like if there are switches on two different parties' maps, the game can get confused, but this has only happened to me once. Q: The Fanatics Tower is really long. What gives? A: I've made some changes to the Tower, with the intent to make it the most frustrating, obnoxious dungeon possible. If you're stuck, here are some hints in ROT13 format. Decode them if you're having trouble. Hint #1: Vg'f zber qvssvphyg tbvat hc guna pbzvat qbja. Hint #2: Qba'g trg qvfgenpgrq. Fgnl sbphfrq ba lbhe tbny, naq riraghnyyl lbh jvyy ernpu vg. Solution: Fbzr gernfher ebbzf ner gencf gung qebc lbh gb n ybjre yriry bs gur gbjre. Nibvq gur gernfher ebbzf naq lbh jba'g trg fghpx. Q: The old man in Narshe won't give me the Ragnarok esper. Is this a bug? A: It's not a bug. Ragnarok (esper) is at a different location. Location: Gur obff ng gur gbc bs Snangvpf Gbjre unf vg. Q: I heard that there's a secret item. How do I get it? A: Va gur svany qhatrba, gurer'f n fznyy vagrevbe ebbz jvgu n qbbe cnfg n pbairlbe oryg gung vf vanpprffvoyr. Gb ernpu gur qbbe, lbh zhfg hfr na rkcybvg gung vf abeznyyl hfrq gb fxvc Cbygetrvfg va inavyyn SS6. Ybbx hc gur Cbygetrvfg fxvc gb svaq bhg ubj gb qb gur gevpx. Q: I heard that there are secret codes. What are they? Q: What level should I be for the final dungeon? A: It really depends on your gear and what builds you have access to. I usually end up going there around level 35-40, but it doesn't hurt to have a few absurdly high level characters to tank hits. Q: Yo this is really hard. A: Yeah I guess so. I was pretty careful to make sure it was always beatable, though. Obviously the difficulty depends on your specific randomization though, so if you're having trouble, don't feel bad about using savestates or anything. I tried to design the randomizer in such a way that savestates aren't necessary, but I can't account for everything. If you encounter anything that is absolutely absurd in difficulty, please let me know so I can try to adjust the balance for future versions. Also, save often! You never know when you'll randomly encounter a boss on the overworld or in a chest. Q: I encountered <boss> as a random encounter/monster in a box! Is this a bug? Q: I can't choose my party for the final battle. Is this a bug? Q: When my character uses X ability, he attacks the enemy and then attacks his own party for low damage! Is this a bug? A: Yes! I don't know how to fix it, but it's a bit interesting in its own right, so I've been ignoring it for now. Q: It says my character can use Blitz/Lore/etc. in their skills menu, but they don't actually know it. A: This is a side effect of replacing the old commands. I'm not sure how to fix it, but it doesn't really affect the game so I haven't really looked into it. Q: I used Control on an enemy and ordered him to use a skill on his own party, but he attacked me instead! A: Some skills are just like that. They're flagged to never be used on your own party. Q: The final boss is impossible! How do I win? A: Gur orfg cerpnhgvba lbh pna gnxr vf univat rabhtu UC gb fheivir Zrgrbe (hfhnyyl nobhg 5000) naq vaihyarenovyvgl gb znal fgnghf rssrpgf, rfcrpvnyyl Fvyrapr. Xrsxn jba'g pbhagre juvyr ur'f pnfgvat Tbare naq gur fperra vf funxvat, fb guvf vf gur orfg gvzr gb fgevxr. Q: The boss of the Fanatics Tower is impossible! How do I win without Life 3? A: Gur pynffvp fgengrtl bs Enfcvat uvz gb qrngu fgvyy jbexf, naq ur vf bsgra ihyarenoyr gb Ofrex. Hfvat Cnyvqbe gb ynaq gur svany uvg pna jbex, ohg or jnel gung ur zvtug fgneg gur onggyr jvgu vaangr Yvsr 3. Nyfb, vs lbh unir n Trz Obk be fvzvyne vgrz, vg zvtug nyybj lbh gb hfr na novyvgl va gur gbjre gung lbh abeznyyl pna'g hfr... Hygvzn pna or Ehavpxrq, sbe rknzcyr. Q: Dude I've got like six cursed shields. A: Fun fact, if you equip cursed shields on multiple party members, you can uncurse one of them 2x or 3x or 4x as quickly. Q: Why can't Gogo select X ability? A: It's probably there. You just have to scroll past the edge of the menu. Unless it's an ability Shadow had and you let him die, in which case, it won't be there. Q: I just got a Game Over, but I didn't get to keep my experience levels. A: This feature was removed because it didn't work properly with one of the new esper boosts. I also wasn't very fond of it to begin with, because I would often get a Game Over and forget to reset so I don't miss out on valuable esper levels. Q: Can you add X to the mini-guide that gets generated? A: Let me know. I'm not sure what kinds of things people want in the mini-FAQ. Q: The guide says a character can learn a spell naturally, but they haven't learned it. A: Yeah, that's a bug I haven't bothered to figure out yet. I think it has to do with characters joining at a higher level than the magic they learn. They'll still learn the rest of their natural magic, though. Q: Can you add X feature? A: Maybe. I'm open to suggestions, but things that require a lot of effort probably won't get made. Q: Can I add X feature? A: Possibly! Even if I don't think it's a good idea for the standard settings, it could be a secret code. Send me a pull request to the project's Github. Q: Does Beyond Chaos work with X mod? A: Maybe, maybe not. I haven't tested Beyond Chaos with anyone else's mods. If it's an elaborate, full-game mod than the answer is no. Some small mods might be compatible, since Beyond Chaos doesn't do rom expansion or anything like that... but it uses up a lot of commonly used free space, so conflicts are likely. Q: Does Beyond Chaos work on a real Super Nintendo? A: Absolutely! Beyond Chaos has been tested on both Super Everdrive and SD2SNES, and it works 100% perfectly. A: Send me a tweet, or a message on Twitch, or post it in one of the Beyond Chaos threads on various forums. I'll check it out.